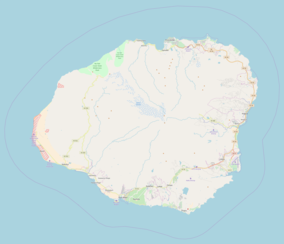 To the east of the state park is the Hono O Nā Pali State Natural Reserve. It was established in 1983, and then extended to over 3,578 acres (14.5 km2) in 2009. Hiking trails and hunters roads have access to the sharp ridges from Koke'e Road (route 550) in Waimea Canyon. Although inaccessible to vehicles, this coast can be enjoyed over land by hiking or in a helicopter, and from the ocean by kayak and paddleboard. Charter tours are available on rigid-hulled inflatable boat or catamaran, originating from Port Allen and Hanalei Bay. The Kalalau Trail from the end of Hawaii Route 56 (called the Kuhio Highway) provides the only land access along the coast, traversing 11 miles (18 km) and crossing five major valleys (and many smaller ones) before reaching Kalalau Beach at the base of Kalalau Valley. Side trails along the way lead to waterfalls in the valleys above. ^ "Hono O Na Pali". official web site. Hawaii Department of Land and Natural Resources. Retrieved 2010-04-13. 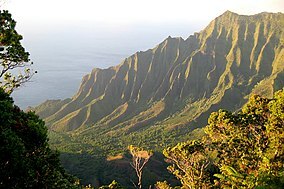 ^ "Nā Pali Coast Wilderness Park". Hawaiʻi State Park web site. Retrieved 2010-04-13. 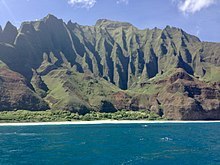 ^ "Nā Pali Coast State Park (History)". Napali. Capt. Andy’s Sailing Adventures. Retrieved 2015-07-20. 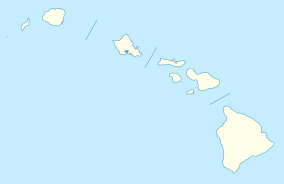 ^ "Nā Pali Coast State Park (Camping)". Hawaii State Parks. Hawaii Information Consortium, LLC. Retrieved 2015-07-20. Wikimedia Commons has media related to Nā Pali Coast State Park.